We recently traveled to Hawaii and found out quickly that there is so much to do and see that it simply cannot be accomplished on one trip. It is an absolutely beautiful place that everyone should try to visit once. Being the creators of RokPak, we always want to take our product and put it to the test in real world situations and places. So here are some of the things we did where the RokPak Pioneer Series was needed on our Hawaiian Adventure. That’s right, we set off before the sun came up and drove to a local marina. There we boarded a small boat and headed straight out for open water. The journey took about 20 minutes, but when we got there we saw a floating cage and they informed us that the water here was over 6000 feet deep. After we reluctantly got in the cage we were surrounded by over 12 Galapagos sharks, which was really cool. They got pretty close and we got some amazing pictures and videos. However, none of those pictures would have been taken had it not been for the RokPak. We were dealing with some jet lag and fell asleep before remembering to charge our phones and cameras. On the way to the boat and the ride out to sea, we were charging our camera batteries and smartphones with the RokPak. The Pioneer Series also kept our important things dry on the boat. It was truly a lifesaver on this particular excursion. This was truly an amazing experience at the summit of Mauna Kea. We rented Jeeps and drove from the beach all the way up to the top of Mauna Kea which at 14,000 feet. This is one of the only places in the world you can go from sea level to that high in about 2 hours. Driving up above the clouds was an amazing experience. Being up there for a nice picnic and enjoying the views a lot of pictures were being taken and a lot of social media posting too! So naturally out cameras and phones were running out of power. Because the sunset at Mauna Kea is so beautiful I brought my tripod to capture it. With my phone almost dead I was worried I wouldn’t catch the whole thing, but I remembered I had my RokPak and plugged in my phone. I was able to capture the whole sunset on video while my phone was recharging. The sunset here is truly amazing, but what follows is even greater. There is no light for miles, and being at such a high elevation, the view of the stars is incredible. It is so good you can even spot satellites going by. Just look for the moving stars, there are actually a lot of them up there, more than you think! 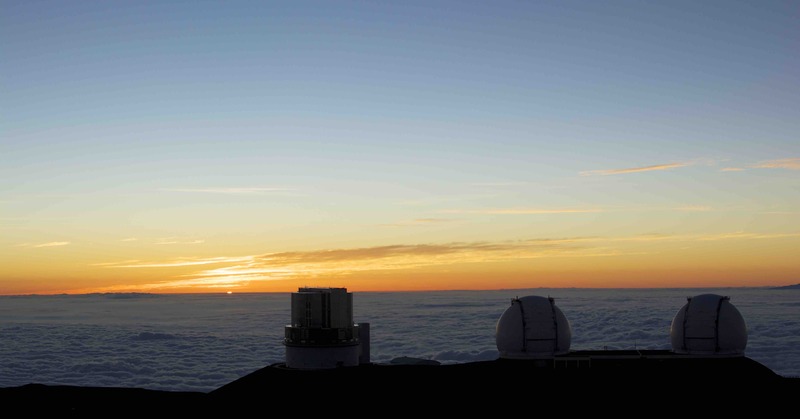 If you have the chance do not pass up an opportunity to see Mauna Kea. These are only two of the awesome things we did on our Hawaiian Adventure and we did so much more, so keep reading the next article so you can learn about a few more things we did on the amazing Hawaiian Adventure. Mauna Kea and getting inside a shark cage should be on your bucket list. I have a feeling that there just might be a RokPak Pioneer Series in a shark cage in Part II and I have no doubt that it will function flawlessly. It has been about 40 years since I visited Hawaii. I’d love to go there again. Not shre I want to do a shark cage adventure, but I’d love to go visit and stay a couple of nights in the Volcano House again. My wife has been to Hawaii several times and always has something nice to say about the nature parks and such. When I lived in the Keys I go snorkeling quite a bit and would come along nurse sharks laying on the bottom about six foot long, they would put a little startle into me. You are so brave to get so close to those sharks, even with steel bars between you. How did the Rokpak do in salt water? Do sharks look at these cages as a challenge before lunch? WORLDS TALLEST MOUNTAIN…FROM BASE TO TOP..SNOW IN HAWAII…YES. Would be a cool adventure to take…….along with my RokPak of course. I want to go on the next trip! Not sure that I would do the shark cage part, but the rest sounds like fun! Good to have gear I.C.E. I would like to see the video of that! The Shark Cage sounds dangerous… better have RokPak I.C.E. Good to have water proof storage and Battery Backup I.C.E. A portable setup like this is important in emergencies and for fun. This looks like a well built kit. Someone’s climbing into a shark cage? Better have a RokPaq… waterproof solar battery backup. So awesome I want one!